“Coolest,” in its very essence, is a very subjective term, but I tried my best to cover construction projects throughout the world that set themselves apart, through either design, construction method, or situation. The Council on Tall Buildings and Urban Habitat (CTBUH) has released their yearly report on tall building completions for 2018. On the year, supertall buildings of 300m (984 feet) broke the record for most completions, but tall buildings over 200m (656 feet) were down, breaking the streak of 4 straight years of broken records. In total, 18 supertall buildings measuring 300 meters or above were completed in 2018. In 2017, which was the previous record holder, 15 supertall buildings were completed. 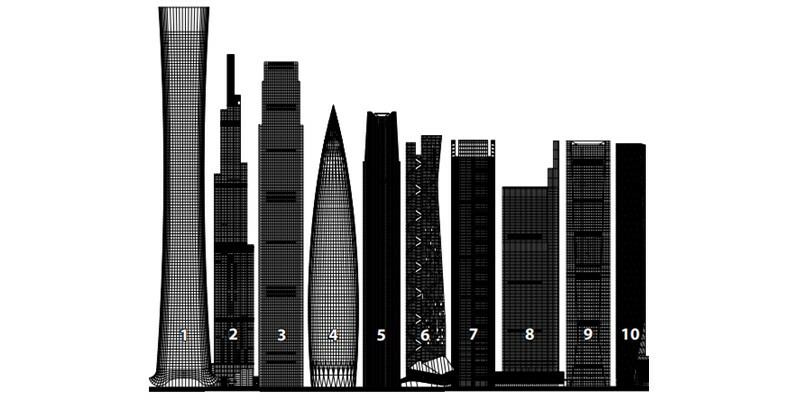 There are currently 144 supertall buildings in existence worldwide. In the year 200, there were only 26. China dominated the supertall list in 2018, totaling 11 of the 18 completed. 143 buildings 200 meters or taller were completed in 2018, according to the report, which is slightly down from 147 in 2017. China built far and away the most tall buildings, totaling 88 in 2018, which was a record of their own. Their previous record was 86 in 2016. The United States and the Middle East were tied with the second most tall buildings completed in 2018, at 13. That number is also a record for the US, whose previous high was 10, set in 1972 and matched in 1990 and 2017. New York doubled its total of supertall buildings to 8 after 4 were completed in 2018. The Middle East was mostly represented by Dubai, unsurprisingly, who alone completed 10 tall buildings. Miami, Philadelphia, and San Francisco all had new tallest buildings in 2018. The Panorama Tower in Miami topped out at 826 feet (252m), Philadelphia’s Comcast Technology Center reached 1121 feet (342m), and the Salesforce Tower in San Francisco measures 1070 feet (326m). The Comcast Technology Center ranked 8th tallest in the world for those completed in 2018, the 3 World Trade Center in New York (1079 feet) ranked 12th and the Salesforce Tower ranked 14th. The CTBUH is estimating that between 120 and 150 buildings 200m or taller will be completed in 2018, which is less than 2018’s projection of 130 to 160. That doesn’t bode well for 2019 being another record breaking year. At 1,428 feet, New York City’s 111 West 57th Street residential tower is expected to be the US’ tallest building completed next year and the second tallest completed in the world, just behind China’s Riverview Plaza A1 at 1,430.